Recent availability of biodiversity data resources has enabled an unprecedented ability to estimate phylogenetically based biodiversity metrics over broad scales. Such approaches elucidate ecological and evolutionary processes yielding a biota and help guide conservation efforts. However, choice of appropriate phylogenetic resources and underlying input data uncertainties may impact interpretation. Here, we address how differences among phylogenetic source trees and levels of phylogenetic uncertainty impact these metrics, and test existing hypotheses regarding geographic biodiversity patterns across the diverse vascular plant flora of Florida, USA. 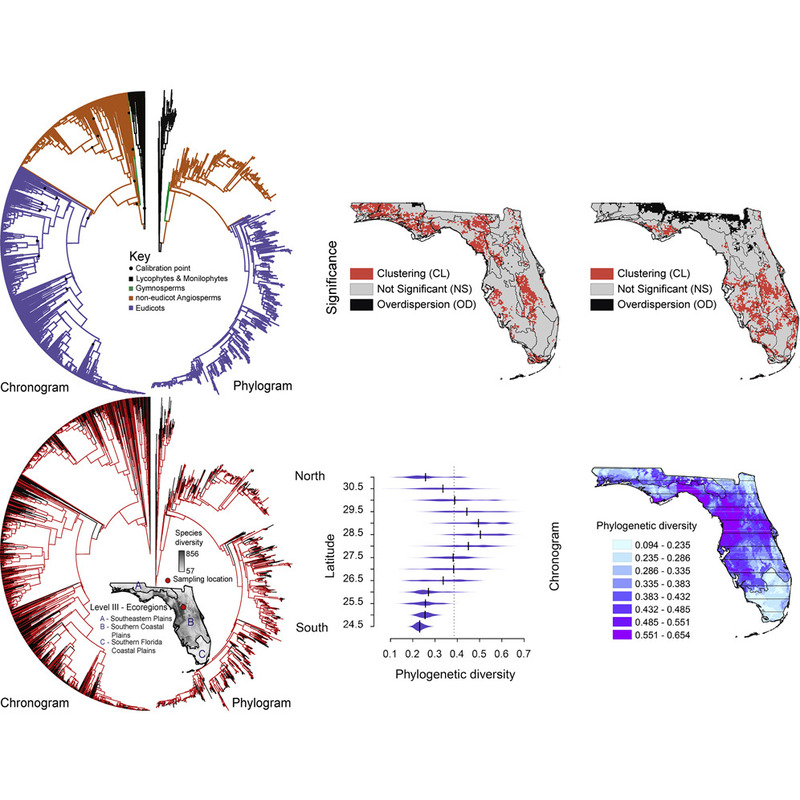 Ecological niche models for 1,490 Florida species were combined with a ‘purpose-built’ phylogenetic tree (phylogram and chronogram), as well as with trees derived from community resources (Phylomatic and Open Tree of Life). There were only modest differences in phylodiversity metrics given the phylogenetic source tree and taking into account level of phylogenetic uncertainty; we identify similar areas of conservation interest across Florida regardless of the method used.